Tom Lee, Fundstrat Global Advisors Head Analyst, has announced the release of the companys 2019 Outlook on the cryptocurrency market. The document outlines the disappointing year digital currencies had in 2018, as well as the fact that expectations for cryptocurrencies are non-existent or very low. Additionally, it also states that 2019 is not necessarily a mainstream breakout year. However, thats also not needed for cryptocurrency prices to eventually bottom in 2019. The report outlines that the company expects prices to stage a visible recovery by the end of 2019, without providing any precise predictions regarding the future value of any digital currency. 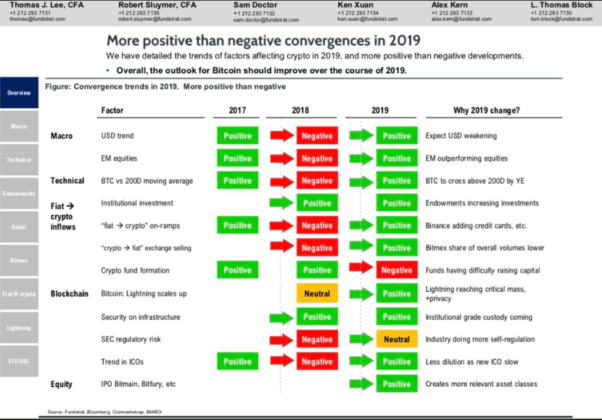 What do you think of Fundstrats 2019 Crypto Outlook? Do you agree that prices will recover by the end of 2019? Dont hesitate to let us know in the comments below!